It’s funny how winning solves everything. Even though the Rockets have beaten pretty bad teams on their way to a 3-6 record, including thrashing the NY Knicks Sunday night, the panic that all Houston fans had when they started the season 0-5 seems like a distant memory. The Rockets have now won three of their last 4 games since then. This Rocket victory reminded me of last year’s team when they used hustle, grit and ball movement to get a respectable record without Yao. Or a few years ago in how they played during their 22-game winning streak. Leading 71-70 in the 3rd quarter, New York made only 2 of their next 21 shot attempts (nearly 12 minutes without a field goal) as the Rockets opened up a 19-point lead and cruised to a victory that has everyone thinking the Rockets aren’t so bad as they looked this time last week. In reality, we still don’t have enough evidence the Rockets can execute their half court offense in the clutch to win tight games. They’ve done it once, against Indiana on Friday night. For now, the best way for them to win still appears to be opening up big leads and holding on, like they did against Minnesota in that blowout victory, and what they did Sunday night against New York. Chuck Hayes did a great job on Amar’e Stoudemire (the Knicks’ highest paid player at $16.5 million this season) by holding him to 3 points after checking in with about 7 minutes remaining in the 3rd quarter. Before then, Stoudemire scored 22 points in his first 22 minutes. Chuck’s value ($2.3 million this season) is a pretty good return holding a player to those kinds of stats who makes more than 7 times he does. On offense, the Rockets had 28 assists, their season-high, on 36 field goals. Amazing. It’s great how the Rockets remembered all of a sudden what made them so effective in previous seasons playing more as a TEAM, and to do it on the road. Maybe there is something to be said about bonding better with your teammates on the road, away from the distractions at home. You might remember the same thing happened when they started off the preseason playing poorly, and were dreading the long flights to/from China. But that’s when they really started playing better as a team as they swept the New Jersey Nets in Beijing and Guangzhou. Who knows, maybe those lunches and dinners they have with each other at the hotel or in restaurants might instill a better sense of trust among each other, manifesting itself in sharing the ball more. There’s nothing worse than watching a game in a packed house and you’re not rooting for the home team–unless you’re winning. With the unpleasant opportunity to watch this one in the world famous Madison Square Garden, a place I usually love to watch basketball, I was made to endure my New York friends deliberately reaching over me to give each other high-fives as the Knicks handed the Rockets a 104-98 loss. My brother chided me from his seat further to the edge of the row for not breaking up their revelry. Anyway, there was again no Yao, and on lunar new year. There were the usual Lion Dances and other related, distinctly Chinese festivities that fill the breaks when Yao’s in town; but there was an extra tremor of expectation in the air for this one. Yao Ming tested out his knee before the Knicks game, but it was decided he play it safe and sit it out. Click here for more photos from Yao’s workout. The Chinese community came out large to support the Big Red One-One… who didn’t play. And MSG was left with a disappointed but nevertheless large smattering of Rockets red. And, of course, there were the New Yorkers devoted to native legends “Skip to my Lou” and Ron-Ron whom presented the odd juxtaposition of Rockets jerseys cheering for the Knicks and occasionally their hometown heroes. For whom neither was the iron particularly kind. Between them and McGrady, 14-49 FGs and 5-28 3FGs. Which should wholly explain how the Rockets lost. Simply explained, it was balance for last night’s whirlwind affair with the net. All is right in the world now, the yin has returned for its yang. Offensively, **it happens, and Houston fans should hardly be unfamiliar but it was again the lack of defense that might turn some skeptical heads. Not having Yao in the paint certainly hurt–Duhon and Robinson’s layups in the 4th might have been tough floaters instead of easy buckets–but match-up to match-up the Rockets D just didn’t look tight. 47% shooting and 100+ pts allowed is not Houston Rockets basketball. Six Knicks players scored in double-figures so there wasn’t any one Rocket to blame. The team defense was poor. Neither McGrady nor Artest were impact players on the defensive end but they’ll get another chance against the nimble 76ers this Wednesday. Where they’ll try not to get blown out of the frame like last time. It’s a game that, even with Yao in the line-up, they just might have to figure out how to defend without him. I’m really bummed for all of Yao’s fans in New York who aren’t able to see him play tonight in the Rocket’s only game in The Big Apple this season. Damn. Yao tested his knee before the game, and the powers-that-be decided to give him a couple more days of rest before the Rockets’ next game against the 76ers on Wednesday. I feel bad for guest contributor Ren Hsieh who bought tickets to see Yao play in the Garden tonight, but he’ll be filing a first-hand report of how the Rockets played. So far, Houston is doing fine, leading 58-55 at halftime. Saturday night’s 96-76 blowout win against the Knicks is the kind of game the Rockets should have had in Oklahoma City Friday night: a convincing victory against an inferior team. New York at 13-22 is much better than OKC. They average 104 points per game and can be dangerous. But the Rockets caught them on the second night of a back-to-back. However, the Rockets were on a back-to-back, too, so they both were on even footing. The way they handled them, though, you wonder why they couldn’t do that the night before against the Thunder. It didn’t start off as a blowout, though. The Knicks got off to a good start, shooting 56% at one point. The Rockets led only 26-24 at the end of the first quarter, and the Knicks actually led 33-28 with 7:55 remaining in the second. But then the Rockets picked up the tempo and ended up taking a 46-45 lead at halftime. The thing that concerned me was the Rockets jacking up 19 three-point attempts in the first half, and making only 4 of them. That’s way too many. Luis Scola was benefiting from all the attention that Yao Ming was getting in the first half as he was double-teamed and fronted. making it easier for Luis Scola to do some damage. Scola scored 8 points in the first quarter. Yao checked out in the second quarter, obviously dragging because of all the running his team started doing. He only had taken 3 shots near the end of the first half, but finished the second quarter strong with 10 points. 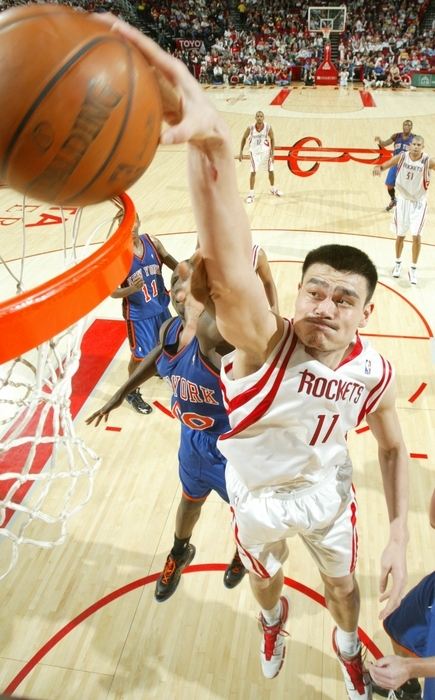 Yao Ming elevates to throw down a massive dunk over New York’s Malik Rose on his way to scoring 36 points on 14-of-21 shooting, 7-of-8 from the line, and 11 rebounds to lead Houston to a 101-92 victory over the Knicks. Click here for more photos from the game. If you’re a Yao Ming fan, it doesn’t get much better than what you saw Wednesday night. Yao had a monstrous game against the Knicks, scoring on some very aggressive dunks and racking up 36 points on 14-of-21 shooting, and grabbed 11 boards to lead the Rockets to a 101-92 victory in the Big Apple, their fourth win in a row. He had a couple of thunderous throw-downs, including one type I’ve never seen him do. With about 3 minutes left in the third quarter, he got the ball just inside the 3-point line, then he DRIBBLED IT once into the lane, took two huge steps toward the rack, and THREW IT DOWN on Malik Rose. To add insult to injury, Rose was called for blocking because he was inside the restricted circle. An amazing play to witness to see Yao take it to the rack from that far away, especially if you watched in HD like I was lucky to have done. The dominance of Yao we saw last year is back. Yao had put up decent numbers this season before Friday night’s game against the Knicks at Toyota Center. He had a monster game against Dallas 4 games ago at home, but since then, he had averaged “only” 21.3 points, 8 rebounds and 1 block. If he does that well Sunday night against Miami and Shaq on Sunday night on ESPN, he should win Player of the Week honors. Yao abused Eddy Curry and the rest of the Knick front line all night. It was clear that Curry didn’t want to have anything to do with Yao, putting up very little defense on most possessions. The Knicks also opted not to double-team him much. Yao took advantage of it, hitting uncontested fallaway jumpers and layups most of the night, and started by scoring 10 of the Rockets first 12 points of the game. He even hustled down the court a couple of times for a dunk and layup. Midway through the second quarter, he had 14 points and 5 blocks. On defense, he was even smart enough to back off of Curry and “pull the chair” from him to make him tumble to the floor and call a timeout. The trick that several players had pulled on Yao in previous seasons is now part of his own repertoire. He does it all. As strong as Yao and the Rockets looked by shooting 50% in the first half, they still only led 51-46 with a couple of seconds remaining before halftime. Dribble penetration by the Knick guards had broken down the Rockets’ offense on numerous occasions, keeping the game somewhat close. But Tracy McGrady gave the Rockets the wider margin they deserved by hitting a fallaway 3-pointer off the glass at the buzzer! By that time, Yao had 18 points to go along with those 5 blocks. 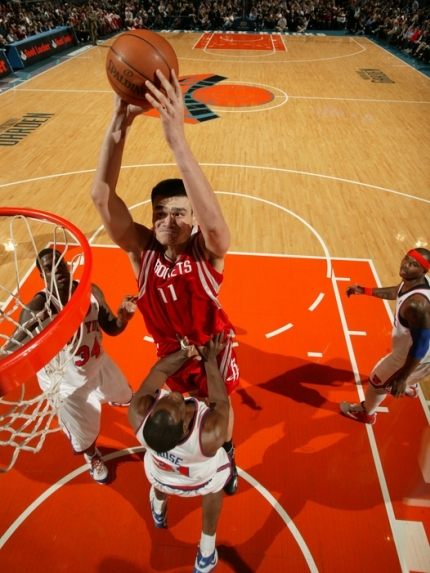 Yao continued his onslaught by hitting a fallaway jumper in the lane to start the second half. The Rockets continued to roll, and opened up an 18-point lead with 7:30 remaining when Chuck Hayes blocked Jamal Crawford ‘s shot, which started a fast break where Rafer Alston threw it to T-Mac at the top of the three-point line for a dagger! McGrady, who had started the game 0-for-5, made 4 of his next five shots to give Yao some help, and the Rockets were cruising into the fourth quarter with an 82-66 lead. But just like their previous game against Milwaukee, the Rockets couldn’t put the Knicks away in the fourth quarter. Houston turned the ball over four times in the first 3 ½ minutes of the quarter while New York scored 6 straight points. But just like the Milwaukee game, Alston came threw when the Rockets were reeling and scored on a tough hook shot at the baseline to stop the bleeding. But the Knicks still kept it close, and with a little over 3 minutes remaining in the game and the Rockets only up by 8 points, Alston came through again with a HUGE buzzer-beating 3-pointer a couple of feet behind the three-point line to give them a 95-84 cushion. I bashed Alston plenty of times last season, but I have to give him props for playing pretty well in this young season. He has hit big shots and is hitting a respectable 39% from three-point territory this season, with many of those shots being hit during clutch moments. Skip-to-my-Lou finished with 13 points, 6 assists and 5 rebounds. If he continues to play at this rate, he could become a candidate for most improved player of the year. Back to the game…the Rockets led 99-86 with about 2 minutes remaining after Yao hit a jump shot, and it looked like the game was in hand. But within 45 seconds, the Knicks had gone on a 7-0 run to cut it to 99-93 with 1:15 remaining, a run that included an amazing rebound and dunk by 5’9” Nate Robinson which even got Houston fans sitting behind the goal out of their seats! On the Rockets’ ensuing possession, Yao had the ball and Robinson came by and hacked him on the arm as he was passing to Alston (no foul was called), which made the pass go off line and made Alston mishandle it and the ball went loose. A mad scramble occurred, with the Rockets desperately needing to gain possession since they couldn’t afford to have New York score again. That’s when Alston dove to the floor for the ball, knocked it to another Rocket to save possession, and T-Mac was fouled and drained two free throws to make it 101-93 with 48.7 seconds remaining. Then on the next possession, Stephon Marbury missed a free throw that could have made it 101-95, and Yao grabbed the rebound. But once again, Robinson mugged Yao and slapped him purposely in the face. A technical should have been called, but it wasn’t. Very quickly Robinson has showed to me he’s a bit of a thug by playing so physical. He better be careful, or he’s going to get hurt one day. After the hack in the face, Yao kept his cool, and drained two free throws to make it 103-94 to put the game out of reach, and finish with an incredible night 35 points on 15-of-21 shooting. Although Yao committed 8 turnovers, you can’t complain much considering the other columns in his boxscore. Speaking of boxscore, the Rockets had all five starters plus Luther Head score in double-figures, with all players shooting 54.8% collectively. Luther, who was sort of the “forgotten man” during all the preseason hype about new players joining the team (Steve Novak, Vassilis Spanoulis, Shane Battier, Kirk Snyder, Bonzi Wells) continues to amaze from three-point territory, hitting 3-of-4 shots. And Chuck Hayes (10 points on 4-of-4 shooting, 6 rebounds) continued to impress on offense. One of those scores was a whirling dervish spin move in the lane for a layup that would leave even LeBron James impressed. Battier (12 points on 5-of-9 shooting, 5 assists) was also huge, blocking out and tipping a rebound to Yao late in the game on a key possession. But my most favorite play of Shane’s was when he took a charge with 6 minutes remaining, and the entire Rocket bench got up to salute him! When teammates are applauding each other for taking a charge, you know the defense that Jeff Van Gundy is emphasizing must be working. I could keep going on with this game and Yao’s dominance, but I’ll stop here and recommend you read some of the quotes from Yao in this Houston Chronicle story. Yao shoots over former Rocket teammate Maurice Taylor on his way to scoring 24 points, grabbing 8 rebounds and blocking 4 shots in another impressive performance, leading the Rockets to a 90-83 victory. To see more photos from the game, click here. SUNDAY, 2/12/06 – I went to the Rockets-Knicks game on Sunday night at Toyota Center, and the Rockets took care of business, beating a struggling New York team 90-83. The Knicks have lost their last nine games in a row, 15 of their last 16 games, and have the second-worst record in the league (now 14-36). I really felt sorry for them because they remind me a lot of Houston when both Yao and T-Mac were out earlier this year, and we all know how painful that was. They have a hard time scoring (38% shooting Sunday night), and just don’t have a superstar that can put his teammates on their back and will them to a victory. I was impressed after the game with what appears to be team unity despite such a terrible season. All of the New York players gathered at mid-court to take part in some kind of prayer, which I think they do after every game, so at least they are trying to stick together through some very tough times. Meanwhile, the Rockets had a hard time distancing themselves from the Knicks in the first half, and I had to think this game had the makings of an upset. The refs were calling the game very tight – too tight – putting both teams on the free throw line 38 times. The game was almost unwatchable, but it was working out to the Knicks advantage. The Knicks made 15-of-22 FTs compared to Houston’s 11-of-16. By the end of the game, 67 free throws were attempted. Yuck! In part because of all those free throws, the Rockets only had a 47-46 lead at halftime, and that was only because David Wesley hit a three-pointer at the halftime buzzer to give them the lead. Part of the problem in the first half was Tracy McGrady’s struggles from the field, scoring only three points on 1-of-12 shooting! The explosion we are so accustomed to seeing this season in the second halves of games when he’s off track in the first half never happened on Sunday night. He only made 2-of-8 in the second half to finish 3-for-20, finishing with 7 points! It was the worst shooting night of T-Mac’s career. I thought he was settling on too many jumpers from the outside and not taking it to the hoop enough, which was surprising because he said a few games ago that when he’s not making shots, he has to take it to the hole strong to get his rhythm. In the third quarter, it looked like T-Mac was resigned to the fact he was doing more harm to his team than good by shooting the ball. He had a couple of plays where he did take it strong to the rack, and I thought he was going to put up a running shot off the glass that were higher percentage shots. Instead, he dished off to Yao who caught the ball on-the-move to the hoop and threw it down for a monster dunk, was fouled, and who made the penalty free throw for a 62-53 lead. On the very next possession, T-Mac drove down the lane again, and I was thinking, “Alright, put it up!” Instead, he kicked it out to Wesley, who nailed a three-pointer for a 66-53 lead. So even though his shooting was pathetic, he did have 7 assists and had the presence of mind to get his other teammates chances to score by using himself as a decoy. The Knicks cut the deficit to 71-66 with 9:45 remaining in the fourth quarter, but Rafer Alston hit a big three-pointer to push the lead to 74-66, and the Knicks would get no closer than six points the rest of the game. I’ve got to give credit to Alston, who hit some big shots when the Rockets were struggling in the second quarter, scoring four points, including a beautiful fake pass as he crossed through the lane and hit a running hook shot. Alston finished with 14 points and 7 assists, and has been playing a lot better recently. He’s not putting up Mike James numbers, but he is providing some relief to his teammates (T-Mac, Wesley, Luther Head) so they don’t have to bring the ball up the floor like they were doing alot during their losing streak earlier this season. Because of that relief, Wesley is also playing a lot better. “D-Dub” scored 15 points on efficient 4-of-8 shooting (4-of-7 from three-point territory) in 37 minutes. 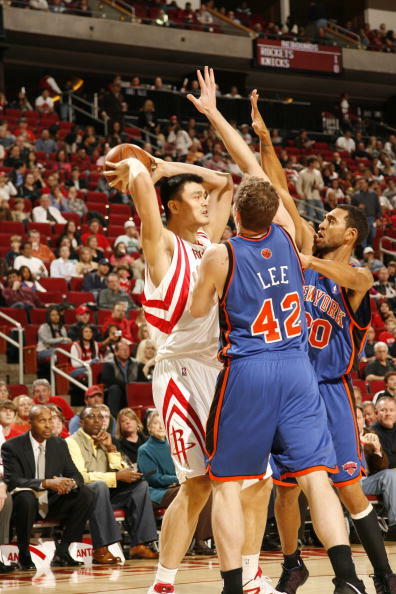 For the third game in a row, Yao was the difference in this game. Without his 24 points (8-of-13 shooting), 8 rebounds and 4 blocks, the Rockets lose this game. The Knicks had no answer for him, with center Eddy Curry fouling out in the fourth quarter. I’ve got to say I think this is the best Yao has played in his NBA career. He’s delivering points when his team needs him, he’s staying out of foul trouble, blocking more shots, and he’s grabbing a decent number of rebounds. He’s also the only NBA center averaging 20 points or more per game. But everyone knows the Rockets have no chance to win on the road against the LA Clippers on Tuesday and Phoenix Suns on Thursday if T-Mac doesn’t get on track. Yao said it himself after Sunday’s game. Thankfully McGrady is a better player on the road than at home this season. However, T-Mac has got to play like his usual self at home if the Rockets are going to make a run at the final playoff spot over the next 31 games. You are currently browsing the archives for the vs. New York category.